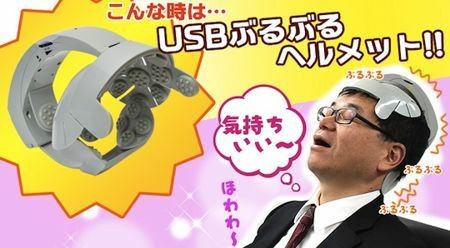 Don’t you think that the Japanese come up with the zaniest ideas? The $30 USB Buru-Buru Helmet Head Massager is definitely one of them for sure thanks to the folks over at Thanko, where it will “vibrate” (buruburu, hence its name) your head, helping give your brain a nice and deserving rest from the accumulated stress while you were at the office. It comes with a gentle shaking function and will be powered via USB or household batteries, making it the ideal tool to use regardless of whether you are at the office or at work. One thing’s for sure, it looks strange as heck on your head, as though it were a modern day Facehugger that had received a technological infusion along the way. You can adjust the size to have it fit different scalp and heads, and the insides of the helmet frame will be lined with multiple vibration pads so that one enjoys a strange albeit effective massage experience.